I looked up a picture of an everything bagel and it does look like someone dropped it on the floor. All it's missing is the pet fur. I'm intrigued by the use of Holey Bagels on the bag. That's the name of a bagel bakery in San Francisco. We've established that The Born Loser takes place in Cleveland, Ohio area so Chip should've used the Cleveland Bagel Company. Maybe he thought firmly in Cleveland would take people out of the story. 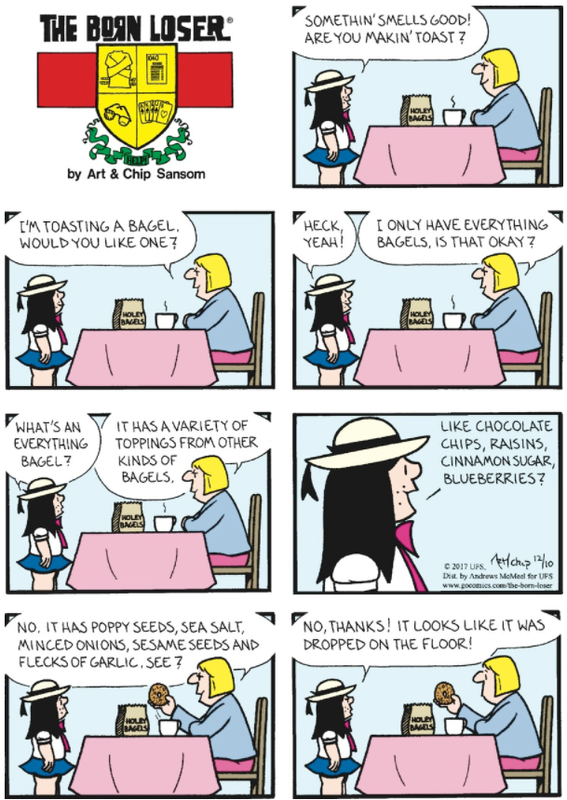 Maybe Chip chose Holey Bagel because he tried one during a vacation to San Francisco to visit Alcatraz, Haight & Ashbury, and Telegraph Avenue.